The Healthcare Foundation’s signature summer fundraiser has a new format and a new name. Healthcare Affair 2019(formerly Wine Women & Shoes), presented by Constellation Brands and hosted by Clos du Bois is here! 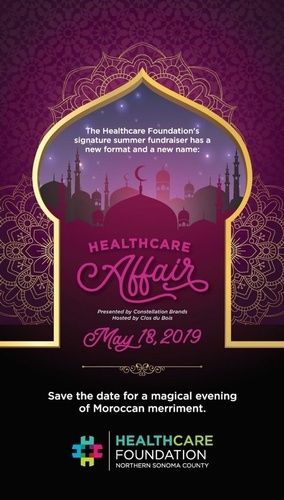 Saturday May 18th at 4:30pm, Healthcare Affair brings together hundreds of influential professionals and community leaders for a night of fun-philanthropy. This Moroccan themed charitable event is a night of fun, wine and fine foods. Guests will be treated to wine and food pairings featuring Sonoma County wines and food from talented local chefs. The silent auction will feature intimate and exclusive experiences. The live auction packages will showcase extraordinary trips and unforgettable vacations. The funds raised at the Healthcare Affair go directly towards creating a healthier community in northern Sonoma County. This event sells out quickly and is a great opportunity to dine with friends and raise a paddle to benefit the Healthcare Foundation. Individual tickets are $250 and provide admission to Moroccan themed delicacies and wine from Sonoma County’s best vintners and chefs. Tables of 10 are available at $2,500 these provide reserved premium seating and Sonoma County wines. VIP tables are $7,500 and provide a luxe experience that offers VIP table seating in front of the stage in the midst of the fun, designated volunteer and server to cater to you and your guests, premium Sonoma County wines and private upscale food. Click here to purchase a ticket or table. Click here for sponsorship opportunites.